The story of John Harrison and the invention of the marine chronometer, a timepiece accurate and hardy enough to be used on ocean voyages. The chronometer solved the problem of finding longitude at sea, a grand challenge problem of the 1700s. The story is concise, engaging, and beautifully told. However, it suffers from a problem common to histories like this: much attention is given to the human drama of the story, and little to the actual technical challenges and engineering solutions. The reader learns what some of the problems were (accuracy, above all; temperature changes; the motion of the ship; etc.) but not what the solutions were. One will not even, in this volume, find a description of how a mechanical clock works in general. There is a passing reference to the importance of the “escapement”, but not even a definition of that term. Further, after reading a related book titled Sextant, I understand that the story is somewhat one-sided. It pits the hero Harrison against his antagonist, Nevil Maskelyne, who seemed to disdain the chronometer and to prefer his own astronomical method, the “method of lunars”. The full story is that both the chronometer and the method of lunars became important and widely-used longitude methods, and they complemented each other. The real solution to the problem was both methods used in combination. 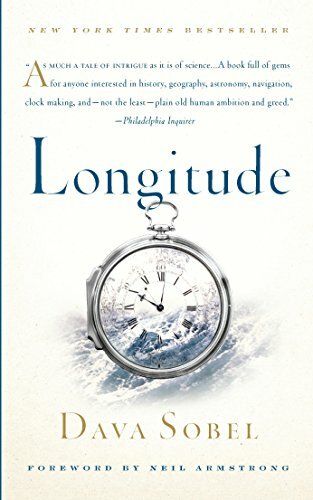 Still, Longitude is well-written and I recommend it for the general science or history reader.